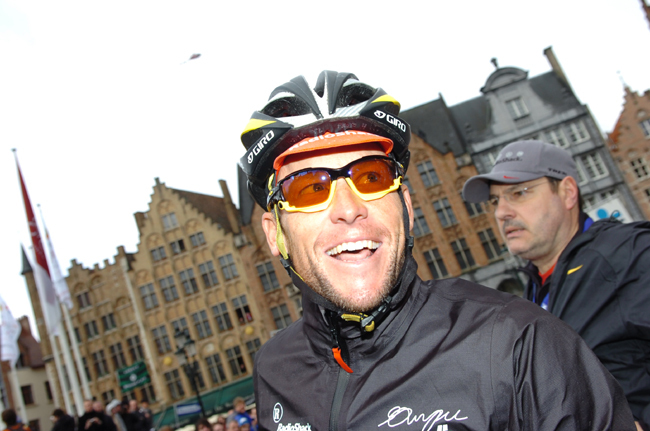 Armstrong at the 2010 Tour of Flanders. I hope this is the last time we post any news about him. ZURICH (Reuters) - Andreas “Andy” Rihs, a Swiss billionaire whose success with the world’s largest hearing aid company Sonova financed his passion for professional bicycle racing and soccer, has died at the age of 75. Rihs, who died on Wednesday and had been suffering from cancer, was in the early 2000s the face of Switzerland’s Phonak Cycling Team, named after his hearing aid brand. He was also owner of Swiss bicycle maker BMC, which has a professional team, and Bern’s Young Boys soccer team. With Phonak, Rihs experienced pro cycling’s highs and lows, when top U.S. rider Floyd Landis won the 2006 Tour de France before testing positive for a banned substance. Another Phonak rider, American Tyler Hamilton, was stripped of his 2004 Olympic gold medal as a drug cheat. “As a passionate cyclist, I am bitterly disappointed that the sport of cycling apparently has become a synonym for doping,” Rihs said in 2006 when he disbanded the Phonak team. Still, Rihs, a hobby rider who himself climbed France’s famed 1,912 meter Mont Ventoux, stuck to the sport, giving millions of francs to build an 8,000-square-metre velodrome in Switzerland that caters to Swiss Olympic athletes. Australian Cadel Evans won the 2011 Tour de France riding for Rihs’ BMC team, a victory that still stands. You can read the entire Reuters report here. 19 April, 2018, Santa Rosa, California (USA): It is with great sadness that BMC Racing Team announces the death of owner Andy Rihs. Andy Rihs died after a patient and valiantly endured illness at the age of 75 on Wednesday, 18 April in the Susenberg clinic in Zurich, Switzerland in the presence of his family. 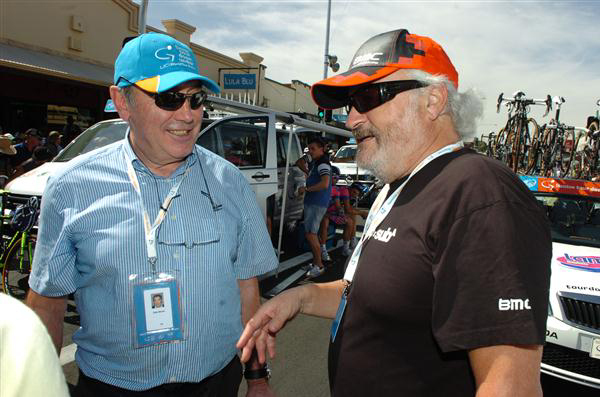 Eddy Merckx with Andy Rihs at the 2012 Tour Down Under. Sirotti photo. Andy was not only an owner and main sponsor of BMC Racing Team, but also a friend who enjoyed life and loved sharing that joy. With him, an exemplary visionary, an avid sports fan, a passionate cyclist, and a great supporter of sport has left us. His generosity, his sense of humor, and his infectious laugh have shaped the man that has been by our side since the beginning of BMC Racing Team. Our grief is indescribable, but we will carry on his values. Not least thanks to the great commitment from Andy, BMC Racing Team has been able to develop so well in both a sporting and economical sense. Andy has served as an inspiration to us all. BMC Racing Team extends its sincere condolences to Andy's family and friends at this time. We will keep Andy in everlasting memory and forever be grateful for his friendship and support. What could be better than another beautiful victory in the race? 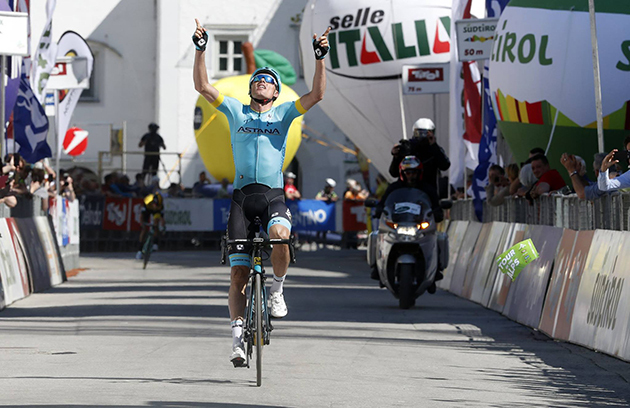 Today, Luis Leon Sanchez brought to Astana Team the third victory at this Tour of the Alps, taking a nice solo win on the streets of Austrian city of Lienz. - Today everything went super. We had a very strong team and it was a key of our success. The guys did a fantastic job, controlling the race and following all the attacks. Firstly, it was Davide Villella in the break, and later we had Miguel Angel Lopez, Pello Bilbao and Nikita Stalnov, who were very attentive to all moves of the rivals. Yesterday we did a good race as well, but something went wrong in the end despite a huge help of my teammates, especially, Miguel Angel. Today, in the final I knew I have to attack to win the stage. I did it for a few times, on the downhill and later inside the last two kilometers. The second time it worked well, and I could get a small gap, enough to win. I am happy with this victory since it gives me motivation and confirms I am in the right place for the Giro. Also, the whole team is strong and ready for the Giro d’Italia, - said super happy Luis Leon Sanchez. Luis Leon Sanchez takes a solo win. It was another warm day at the Tour of the Alps with a fast start in Klausen. For some time nobody could break away, but after the first climb, finally, a group of 9 riders went away with Astana’s Davide Villella inside this break. Villella did a good and brave race and was able to stay in front until almost the bottom of the final climb of the day Bannberg. There were several attacks from the group of GC favorites, Astana Team had Pello Bilbao and Nikita Stalnov among the attackers. Anyway, to the top of the last climb all GC favorites came together. A few riders, including Luis Leon Sanchez, tried to escape on the descent, but the winning move came from Sanchez, who attacked with 2 km to go to win this stage. George Bennett finished second, while the Dutch rider Koen Bouwman did third. Astana’s leader Miguel Angel Lopez finished 7th and Pello Bilbao was 9th. The French rider Thibaut Pinot still leads the general classification with only one stage to go. Miguel Angel Lopez holds his 3rd place, 15 seconds behind the leader. Luis Leon Sanchez is 6th in the overall (+1.06), while Jan Hirt is 10th (+1.55). Stage 5 of the race will be held tomorrow: 164,2 km from Rattenberg to Innsbruck. A part of the stage will be held on the circuit of the 2018 Road World Championships. George Bennett and Koen Bouwman have both ended the fourth stage of the Tour of the Alps with a podium finish. Bennett was second, Bouwman third. Team LottoNL-Jumbo's duo attacked several times in the last twenty kilometres and secured a top ranking. During the chaotic stage under warm conditions, there were many attacks from the group with favourites. Both Bennett and Bouwman tried to break away several times. For a short while, Bouwman seemed to be gone for good, but he was picked up just before the summit of the last climb. That turned out to be part of the plan. “I did not want to waste all my energy on that climb, and I rode away from that group at my own pace. On the steep stretch I waited, because I knew that Aru was coming. Back in the group we rode to the finish, I had a good chance of winning. It was a pity that it didn’t end in a sprint for the win. Eventually I won the sprint for third place. Becoming second and third gives us confidence for the Giro." George Bennett was also seen in the front several times. In the last kilometre he tried to compete with Sanchez, who ultimately won the stage. Bennett didn’t manage to ride for the win, but he wasn’t caught by the thinned peloton either. Sepp Kuss, for example, abandoned the race today. “If I feel good tomorrow, I will attack again. If I don’t, I’ll follow. We’re riding this race with a 'no stress' approach”, the New Zealander concluded.